Savannah’s & Tybee Island’s Jet Ski — non-stop Jet Ski fun!! Ready to hop on one of our waverunners for an hour of jet ski riding fun? Jump some waves in Dolphin Bay? This is the place that makes it happen. Bring friends, kids or the entire family to experience an awesome outing on our jet skis. 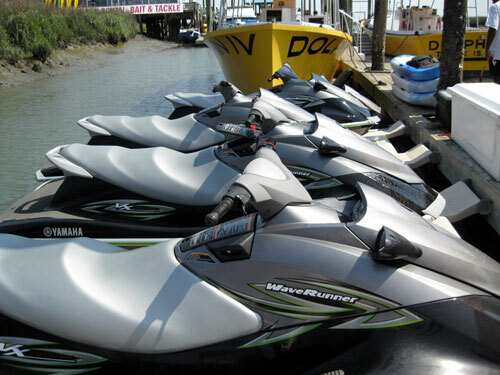 Here at Tybee Jet Ski & Watersport, you will have the opportunity to drive fast or slow – do doughnuts or watch the wildlife – or try it all, you choose your fun during an hour of action in Dolphin Bay. Don’t worry if you have no experience, we have trained personal watercraft activity coordinators to give you basic instructions on how to operate the waverunner, they also monitor the water if you need assistance. So come and join the fun. All reservations must arrive 30 minutes before departure time so that we may check your group in. A full charge will occur for any reservations that do not show up 30 minutes before departure time! We welcome walk-ups but reservations are suggested. All renters must have valid photo ID and a major credit card. Take advantage of our water photo package. We will take some awesome photos of you having fun on the water . These pictures will be available for purchase at the office. Take one home or post a picture or two on social media………………. All the pictures you see on our web site are photos previously taken of customers that have visited our establishment. Special treat: While cruising around Dolphin Bay, watching the birds and wildlife, don’t be surprised if a dolphin or two stop by to say hello. Call and make your reservation now!! !